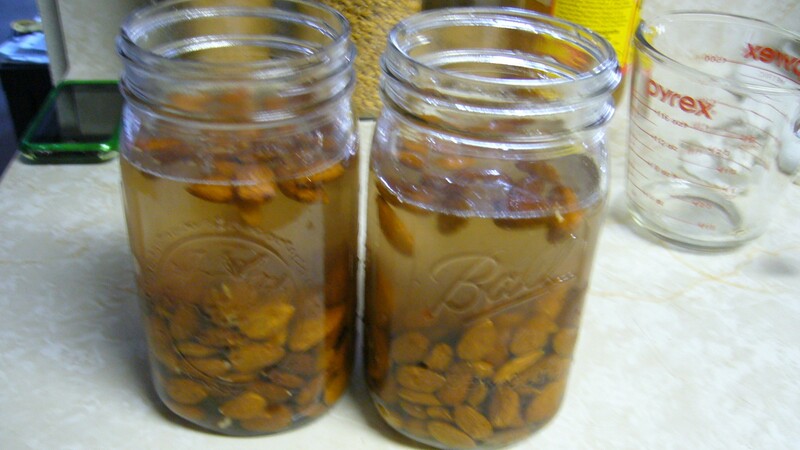 My second recipe to try for my eCourses was to soak and dehydrate some raw nuts. From my eCourse, I learned that raw nuts are an awesome source of digestive enzymes, which you can’t get from a pasteurized or roasted nut. Our bodies can create two enzymes: digestive and metabolic, so if we stock up on raw nuts, our bodies don’t have to produce as many digestive enzymes and can focus more on metabolic enzyme production (which can result in better metabolism and healthy weight loss). However, raw nuts also have phytic acid, which prevents our bodies from absorbing all the nutrients we eat when it is eaten in large quantities or in a poor diet. Soaking helps neutralize the phytic acid and dehydrating dries up the soaked nuts in a way that keeps them still raw (and full of digestive enzymes)! I decided to try out raw almonds for this recipe as I had just found a good source for truly raw organic almonds. I’m told that most “raw almonds” found in grocery stores aren’t actually raw in California, but rather have been pasteurized, so if anyone is looking for truly raw almonds, please do some homework and research your sources! This recipe ended up being so easy, everything went smoothly, thank goodness! 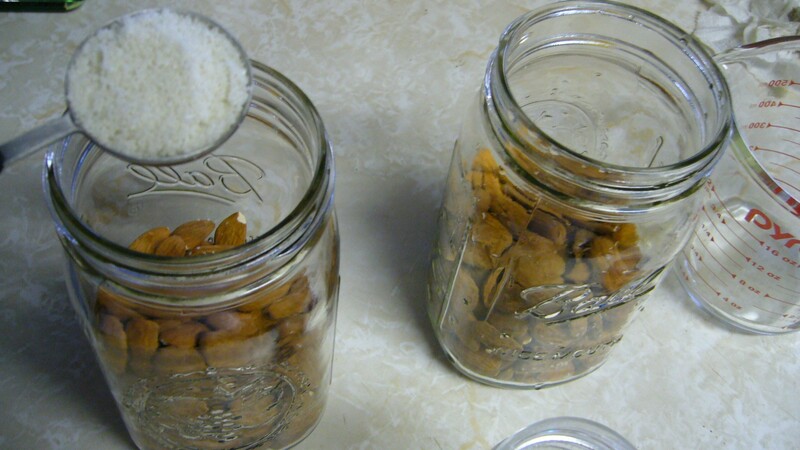 First step was to measure out the raw almonds, place them in some mason jars, and add celtic sea salt. The salt actually doesn’t do anything for soaking, but it gives the nuts a yummy salty flavor! Next, I added pure water to the almonds and salt. This soaking stage is supposed to mimic germination for the nuts, so a warm and wet atmosphere is needed to wake up the nuts back to life, or in other words: sprout. And when the nuts start to sprout/germinate, an enzyme called phytase is released and helps neutralize the enzyme inhibitor, phytic acid. After I added the right amounts of water, I put them in a warm place in my kitchen over night. This is what they looked like the next day. You can see that the almonds really have plumped up, and there looks to be extra residue in the water now. 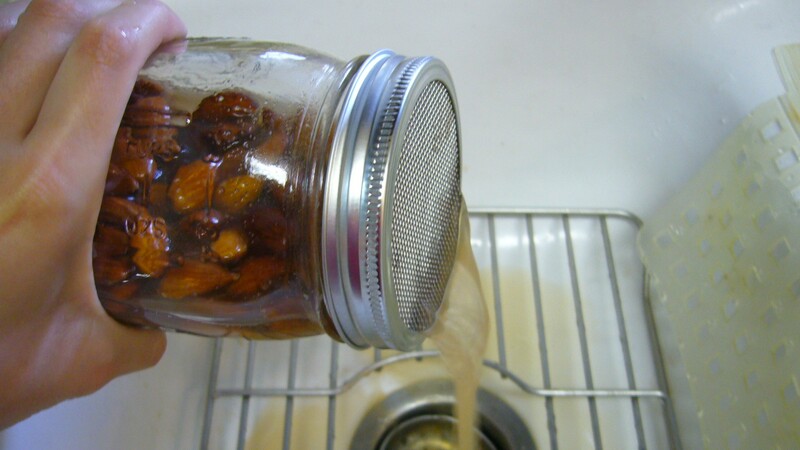 I drained the almonds in the sink using a sprout screen on my mason jar. Notice how the water is brown and yucky! The phytic acid should all be neutralized now after the soaking process. 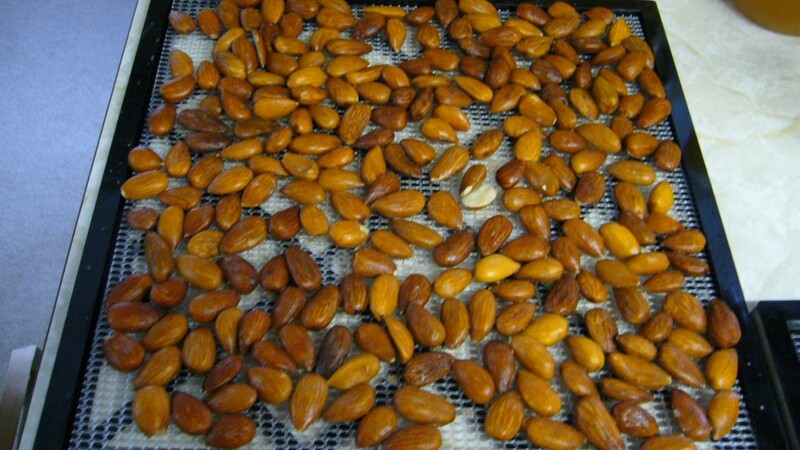 At this point, I could use these wet almonds and make raw almond milk (which I hope to do one of these days), but I opted to just dry them in my new dehydrator. 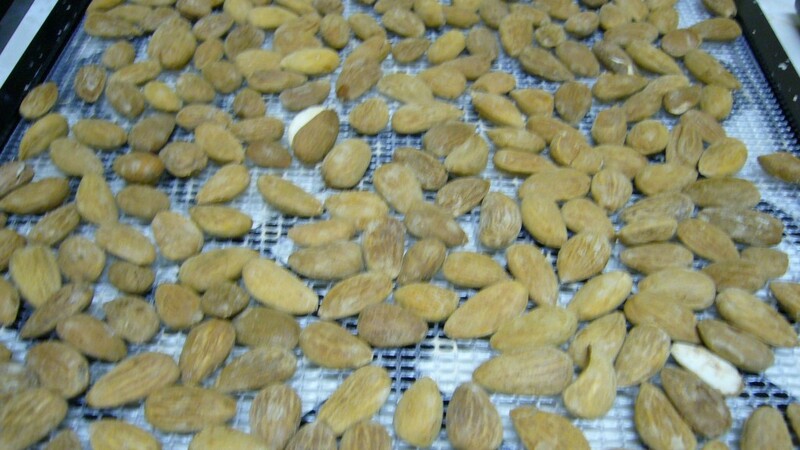 Here, I’ve laid out the almonds on one of my dehydrator trays. 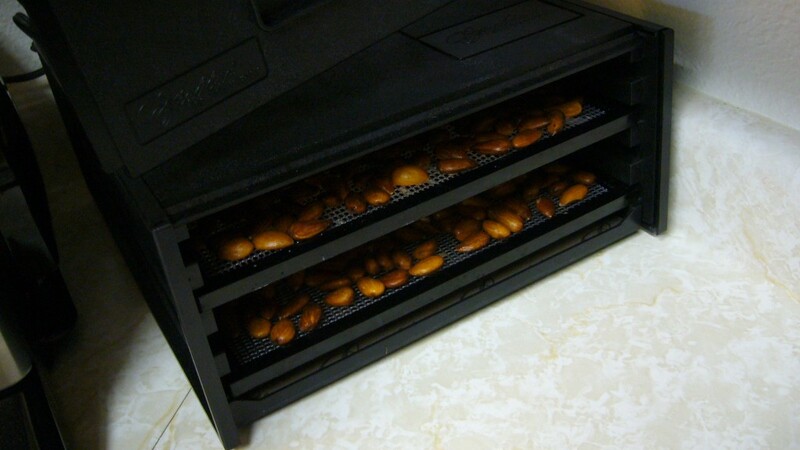 Here are two trays full of soaked almonds ready to dehydrate in my new Excalibur Dehydrator! I set the dehydrator to 145° F for about 1-2 hours, then set it back down to 118° F for another 22-23 hours (low temperatures so that the nuts don’t actually cook while they’re drying). And then my almonds were done drying. Delicious crispy raw almonds with a slight saltiness! These guys disappeared real quick, Rene and I really enjoyed them! Do you have a great recipe for nuts? I love eating these almonds as is, but I want to diversify my cooking knowledge and use these almonds for other recipes, too. Please share your awesome recipes! Thanks for posting! I’ve had some “raw” almonds from the grocery store staring back at me when I open my cupboard for way too long and so I am glad to find your blog post… I can’t afford a dehydrator so I will use my apartment’s gas oven (which is always pretty warm and very dry) to do it, won’t even have to turn it on. Now I’m going to explore the rest of your blog! Hi Nicole, I’m glad to be of help! I was very much in your shoes only a few months ago. I loved seeing how all these awesome real food blogs shared how they prepared foods the traditional way. So when I started up my blog, I wanted to make sure to include lots of pictures to show that anybody can do this, and perhaps a few pictures showing how one person does it can easily help another feel like they could attempt the same themselves! Hope you enjoy the rest of the blog! I have heard anything under 150 degrees will be safe for almonds. I think I’m going to go with this, too. Sally Fallon says so in Nourishing Traditions, and that’s proof enough for me. 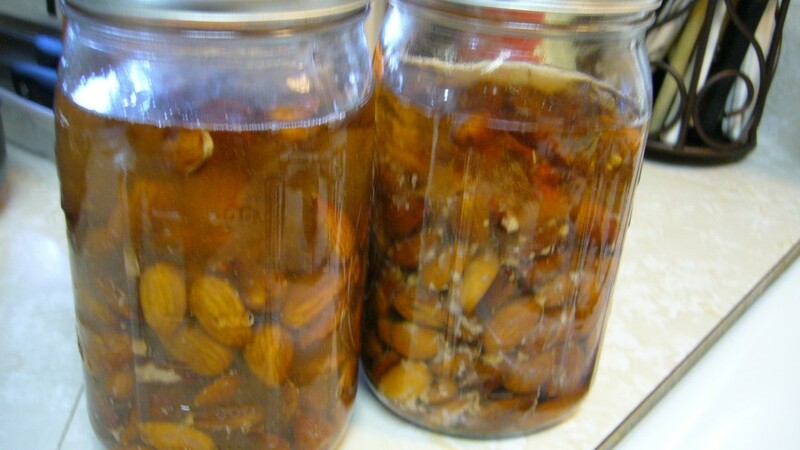 Your almonds sound really yummy, but next time try dehydrating them at 105 degrees or lower. All the enzymes you described actually die above 105 degrees. They taste crispy and delicious, exactly the same, but take a day or two longer. Happy dehydrating! I’ve actually heard several different takes on what keeps raw nuts raw during the dehydration process. From 105 degrees to 118 degrees to even 150 degrees. I’m certainly no scientist on this matter, but I’ll keep researching it further! Thanks for dropping by and sharing! This sounds yummy! What was your almonds-to-salt ratio? Thanks! I had about a pound of almonds to about 1-2 tablespoons of celtic sea salt. Hope that helps! So glad you posted about the almonds…step by step…thank you. No problemo! The hardest part for me when I first started getting into real food and the WAPF diet was to see how other people did it. So when I started up this blog, I realized that I wanted to fill in the gaps with pictures of stuff I did on recipes. To me, it’s easy to find recipes for this stuff, but harder to find step by step pictures of how someone does it! And after I see how someone does do a recipe, I feel more empowered to try it myself. I hope that my pictures will do the same for my readers! 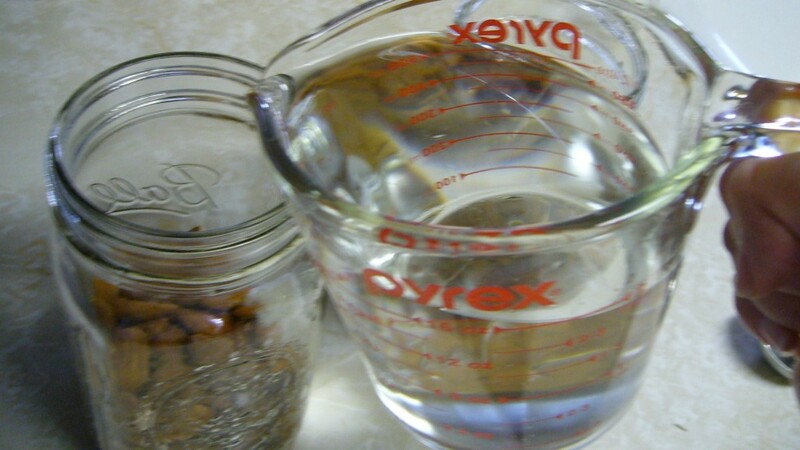 I read somewhere that it also helps to drain the soaking water off of the almonds every 2-3 hours…would be a pain to do when soaking overnight but apparently it helps further reduce the phytic acid content. I am doing some right now and figure I will drain the nuts at least a couple times before I go to bed. Thanks for the step by step pictures…very helpful. I’m hoping these nuts will be easier for my son to digest. What does that mean, drain the water off? Should I put clean water in after draining? Hi Cheryl, I don’t usually put any clean water on the nuts after I pour off the soaking water, as I want to keep the salty flavor on the nuts. I just put the nuts straight into the dehydrator. However, I have heard of others rinsing nuts/seeds/grains after the soaking process to get rid of any lingering phytic acid. Hope that answers your question! What is the ratio of water to nuts for the soaking or does it matter?